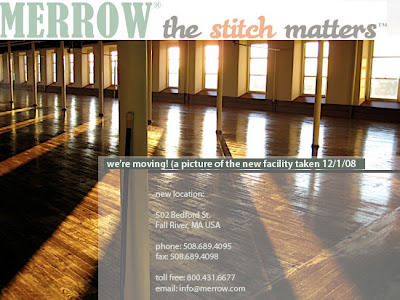 the move - Merrow Sewing Machine Co.
A long time ago Fall River, MA was the epicenter of fabric production. Out of our new south facing windows we look at the Durfee Buffington building; once the largest textile mill in the world. Today we are residents of 502 Bedford St., and take up the top floor of a 132 year old Mill Building. Merrow is spread across 30,000 sq. feet with terrific views of a half dozen other mills, and most of Fall River. It will take us another six to eight weeks to finish the renovation. But as of right now, we've got new digs. And it feels great.